Disability culture is a widely used concept developed in the late 1980s to capture differences in lifestyle that are caused or promoted by disability. Disability cultures exist as communities of people around topics of disability. The cultures include arts movements, coalitions, and include but are not limited to: poetry, dance, performance pieces, installments, and sculptures. Steven Brown, in an academic study, wrote, "The existence of a disability culture is a relatively new and contested idea. Not surprising, perhaps, for a group that has long been described with terms like 'in-valid', 'impaired', 'limited', 'crippled', and so forth. Scholars would be hard-pressed to discover terms of hope, endearment or ability associated with people with disabilities." Disability culture cannot be defined by one specific description or language. It is a complex blending of art, performance, expression, and community. 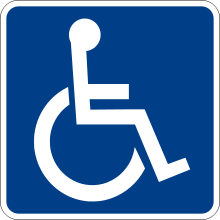 Within this culture, the word "disabled" has been re-purposed to represent a social identity of empowerment and awareness. Like many civil rights movements in the past, disability culture challenges the norms of society, and seeks to counter oppressive entities such as medicalization and institutionalization. Its core values as a culture are reflected in art, conversation, goals, or behaviors. These core values often include: "an acceptance of human differences, an acceptance of human vulnerability and interdependence, a tolerance for a lack of resolution of the unpredictable in life, and a humor to laugh at the oppressor or situation, however dire it may be". ↑ Vasey, Sian (1989). "Disability culture: it's a way of life" (PDF). Feminist Arts News. 2 (10). ↑ Brown, Steven. "Investigating a Culture of Disability Final Report" (PDF). Retrieved 26 March 2013. 1 2 Gill, Carol (1995). "A Psychological View of Disability Culture". Disability Studies Quarterly (Fall Issue): 1–4 . Retrieved 3 April 2013. ↑ Kuppers, Petra (2011). Disability Culture and Community Performance: Find a Strange and Twisted Shape. Houndmills and New York: Palgrave. p. 109. ISBN 978-0-230-29827-9. ↑ Ferris, Jim (2011). "Keeping the Knives Sharp". In Bartlett, Jennifer; Black, Shiela; Northen, Michael. Beauty is a verb : the new poetry of disability (1st ed.). El Paso, TX: Cinco Puntos Press. p. 91. ISBN 978-1935955054.